In honor of the 100th Anniversary of the US National Park Service, we decided to write an article with some of the most historic moments in NPS history, enjoy! The federal government has set aside many of the nation’s most scenic and historic places as national parks and monuments for the public’s use. This endeavor ensures that these treasured places of interest are preserved for the enjoyment, education and inspiration of people for generations to come. The first person to promote the idea of a national park was artist George Catlin in 1832. The concept for a series of national parks grew out of the conservation movement that began in the 19th century. There was an increased desire to preserve spectacular landscapes as well as significant historic and cultural sites with the publication of a great number of books, articles and pamphlets about nature and the wilderness. Key writers in the conservation movement included Clarence Dutton, John Wesley Powell and John Muir, the founder of the Sierra Club. Henry David Thoreau and James Fenimore Cooper also penned romantic portrayals of nature. In 1864, President Abraham Lincoln signed legislation transferring Yosemite Valley to the State of California to be held in public trust for all time. With its designation in 1872, Yellowstone became the world’s first national park. The site was originally managed and protected by the U.S. Cavalry. Over the ensuing four decades, these treasured parks, reserves and monuments were supervised at different times by various federal agencies, including the Agriculture, Interior and War Departments. Although the concept of national parks enjoyed broad public support, there was a lack of coordinated policies for financing and administering the parks. Some organizations were also initially concerned about the conversion of monuments and wilderness reserves into national parks. The federal government authorized many national parks, monuments and reserves be created by setting aside government-owned land in the Western United States and through real estate purchases in the East. Signed by national park proponent President Theodore Roosevelt, the Antiquities Act of 1906 was designed to protect historic landmarks, prehistoric structures and other places of scenic importance. That same year, Roosevelt declared Devils Tower the country’s first National Monument. As the amount of land set aside continued to grow, the Department of the Interior was responsible for the nation’s parks. While the War Department managed national monuments, the Forest Service of the Department of Agriculture oversaw forests, reserves and parklands. There was still no single agency providing unified management of these various federal lands. While many people supported conservation and preservation efforts, they also lamented the lack of proper oversight. As a result, industrialist and philanthropist Stephen Mather launched a campaign to create a National Park Service. Mather gathered support from newspapers, schoolchildren and other captains of industry as well as the National Geographic Society. His initiative achieved its objective in 1916 when President Woodrow Wilson established the National Park Service (NPS) Aug. 25 that same year with the approval of the Organic Act. A part of the Department of the Interior, this new federal bureau became responsible for the country’s 35 national parks. Maher was appointed the agency’s first director. The creation of the park service led to a number of initial changes as some federal land was redesignated. Because its mineral springs have been used for medicinal purposes, Hot Springs, Arkansas was set aside as a federal reservation in 1832 to protect it for future use. With the advent of the NPS, the reservation was designated a national park in 1921. It is the oldest and smallest park under the NPS. Denali, home to the highest peak in North America, was one of the first national parks created after the approval of the Organic Act. Other land was eventually added to the system. Designated a National Monument in 1908, the Grand Canyon became a national park 11 years later. To eliminate overlapping agency oversight, President Franklin Roosevelt signed Executive Order 6166 in June 1933 reorganizing the NPS. The presidential action moved the management of the country’s national monuments, cemeteries, memorials and capital parks under the auspices of the park service. This made the NPS the sole agency responsible for managing these federally-owned properties. The areas include the Statue of Liberty, Gettysburg National Cemetery and the George Washington Memorial Parkway, the nation’s first recreation area. Between 1933 and 1966, land management was moved from the War Department, the Forest Service and other government agencies. During the Great Depression, the Civilian Conservation Corps played an important role in revitalizing and improving national parks and other nature reserves. This period saw 102 areas added to the national park system. These included the Blue Ridge Parkway, the Cape Code National Seashore and the Lake Mead Recreation Area. In 1935, President Franklin Roosevelt also designated more than 47,000 acres as the Fort Jefferson National Monument under the authority of the Antiquities Act. The area surrounding by the monument was expanded in 1983. 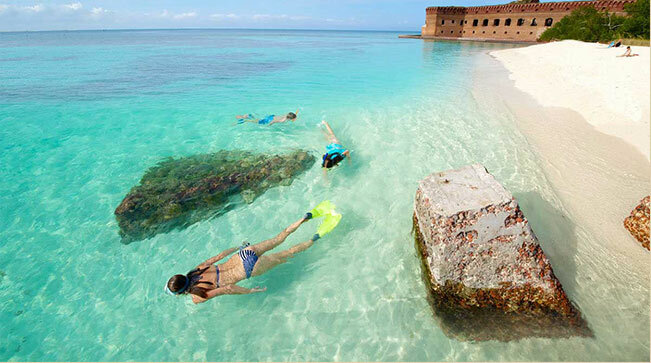 Nine years later, the monument was redesignated as the Dry Tortugas National Park. It preserves not only Fort Jefferson but also the seven islands that comprise the archipelago 68 miles west of Key West and the marine ecosystem of the surrounding coral reefs. In addition to the large coastal defense fortification, the park is noted for its profusion of tropical birds and sea creatures as well as sunken shipwrecks that are now prime snorkeling and diving sites. It is the southernmost national park in the continental United States and one of 11 National Parks in Florida. The 1960s brought addition public awareness of the country’s abundant natural and historic wealth. Director George Hartzog, Jr. oversaw projects making the national parks more accessible to the public. This included the creation of national recreation areas and urban parks within a short distance of major cities. The National Park Service Organic Act of 1916 was amended by the Redwood Act in 1978, which made all the areas managed by the park service equal in stature regardless of their location or designation. Two years later, Wrangell-St. Elias National Park in Alaska was added to the system. Encompassing more than 8.3 million acres, it is the country’s largest national park. Situated below sea level, Death Valley National Park is renowned as the hottest, lowest and driest national park. The park was added to the system in 1994. While additions to the national park system are made through acts of Congress, the president has the authority under the 1906 Antiquities Act to designate national monuments on land already under federal control. Congress asks the Secretary of the Interior to make recommendations for additions to the system. The secretary makes his recommendations based on input from the National Park System Advisory Board, a committee of private citizens and conservationists. More than 20,000 National Park Service employees now oversee a system of over 400 parks, battlefields, monuments, seashores, recreational areas and numerous other areas in all 50 states that encompass 84 million acres. The sights are a public resource for preservation, recreation and education that also provide habitats for rare and endangered species. The National Park Service also maintains land in Puerto Rico, the Virgin Islands, American Samoa and other U.S. territories. The country’s national parks contain volcanoes, glaciers and rivers of grass as well as mountains, valleys and bodies of water. Each park went through a period of discovery, exploration and the understanding that it should be preserved for future generations. The process is ongoing as more land is set aside to be managed by the National Park Service in an effort to preserve the nation’s rich natural and cultural history.